Moderating "Web Analytics & Actionable Insights" at Econsultancy's Digital Cream 2013. Recently I had the pleasure of moderating the Web Analytics & Actionable Insights panel at Econsultancy's Digital Cream 2013 event in Singapore. 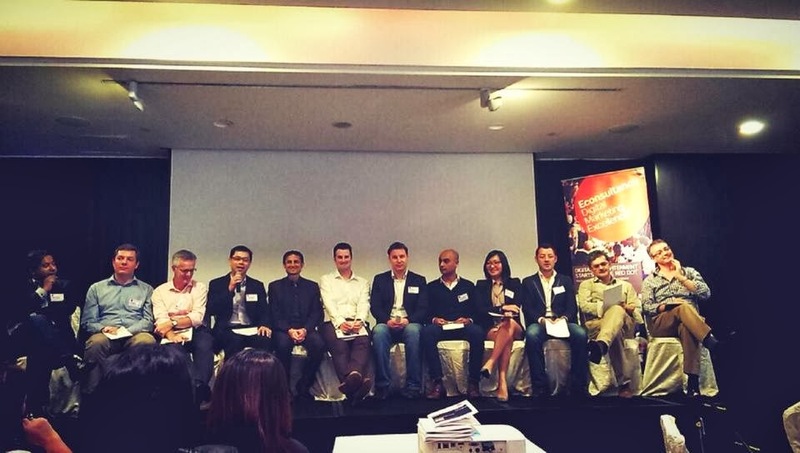 In my opinion the Digital Cream event is one most prestigious and valuable events because it brings the top 150 digital marketing leaders across Asia together in one room to debate and share insights. Measurement is useless without strategy. First, that there tends to be a focus on measuring digital metrics but this is usually quite disconnected from a marketing or business strategy. The key theme of that discussion thread is that if you don't have a strategy in place, you don't need analytics to measure your success. It's critical to understand your end goal, and what metrics are important for your brand before embarking on developing a digital dashboard and key metrics. Second, there was a discussion around evolving platform usage. In 2013 mobile web traffic is already at 28%, with a predication of over 50% of web traffic from 2014. This means that a web analytics plan needs to think broader than PC, and focus more strongly on measuring content and interactions on mobile devices and tablets. Resourcing for Analytics into the future. Third discussion point was about how to get started and what resources are needed. It was agreed that if you're new to Web Analytics, it makes sense to outsource this to an agency in the early days. However, as all businesses become fundamentally digital it's important to have Analytics as an internal function. The challenge though, is that right now this responsibility is given to an already overworked marketing team or marketing manager. So the big question is whether organisations will grow specific Web Analytics teams, or whether it needs to be decentralised and made a responsibility of all marketers? The consensus was everyone needs to understand Web Analytics but for Actionable Insights, this requires a higher level of skill and knowledge. These "strategic analysts" will be the "Chief Data Officers" of the future. 6 Guidelines For Becoming A Social Business. My latest presentation: 6 Guidelines For Becoming A Social Business. There are thousands of research documents, millions of opinions, and the experience of almost everyone on the planet that digital is the new normal. Smartphone penetration is ridiculously high, with the passionate debate about Android vs. iOS and Samsung vs. Apple making headline news. There are over a billion people using Facebook, with hundreds of millions of people using Twitter, LinkedIn, Pinterest, Vine, and other social networks. Google, Baidu, and Bing searches are a daily part of everyone’s every day lives, as well as critical to finding any information nowadays. So, why are marketing managers struggling to spend even a small percentage of their media in digital? It’s big news when companies like P&G announce that they’re moving their digital spend to 35%. For me, the big question is whether this is enough? Consumers don’t spend 10%, 20%, or 35% of their time using digital devices and media, so what’s the bottleneck? CEOs don’t trust CMOs. This is the biggest contributor to why marketing budgets get cut and new initiatives don’t get off the ground. Marketing is not as clear cut as Sales. Sales have easy to understand metrics like sales, profit and market share. Marketing and Advertising deals in intangibles like brand, customer satisfaction, reach/awareness, and purchase intent. Too often, Marketing leaders don’t take the time to truly connect and engage with the CEO and other executive leaders. This has lead to the erosion of trust. Marketers rely too much on their media agency partners to spend their money. Media agencies are fantastic at optimising a media budget, but they have inherent bias towards certain media. TV is still top of mind for most media agency leaders due to its reach and ability to quickly launch a new product.Online video (the nearest digital equivalent) is far too fragmented and requires a deeper level of understanding of less understood elements like content marketing, YouTube (and YouTube celebrities), and Mobile marketing. Similarly, it’s easy to understand that print and OOH are going to get a brand a wide audience and boost awareness. What’s missing is the understanding thatconsumer behaviour has changed and people are expecting a different, deeper relationship with brands. A print ad will never change behaviour in the way a conversation with friends on social media can – digital is the only way to interactively engage consumers and build brand preference and true loyalty. True consumer digital usage is on platforms and devices, not in media. The focus has to be moving marketing budgets from media to production. Building a website is not a media spend. Creating an engaging mobile experience via an App is not a media spend. Engaging social media influencers and advocates is not a media spend. e-CRM is not media. For true digital engagement the focus needs to shift to capability building activities and “creating” things, not simply buying an empty space and filling it with an ad. CMOs don’t understand the value and ROI of social media. Marketers understand that consumers are deeply engaged in platforms like Facebook, Twitter and LinkedIn, but most haven’t figured out the right way to engage these consumers. Instead of listening to customers, understanding their passions and needs, then engaging in a open, honest and relevant discussion with them, it seems most brands simply want to relentlessly spam their fans/followers/connections with product info or useless trivia. In fact, in my experience, up to 45% of activity on a brand’s Facebook page is customer service-related (complaints, questions, etc. ), so pumping out spammy product content in that kind of environment completely misses the mark. This all leads to the confusion around ROI. If CMOs don’t understand the best way to use social media, it’s going to be very unclear on how to measure its success. This article first appeared on the Firebrand Talent blog. Recently I’ve written about my perspective on the role of a modern CMO and have given tips on how to climb the corporate ladder if you’re a digital marketer. However, not everyone aspires to be a CMO. Many are eager to get into digital marketing and those already in the field want to become better, to be truly great digital marketers. One of the biggest challenges in digital marketing is about definition. What exactly is “digital” and what types of digital marketing practitioners are out there? The Technologist is the tech geek. This is someone who is comfortable talking about website development builds, web hosting, e-commerce or other technology-heavy digital initiatives. The Strategist is passionate about consumer behaviour. They want their marketing and % of media spend to match the massive amount of consumer time being spent online or using a mobile device. They live and breathe digital, but may come up short when it comes to deep operational insights or how to make it happen outside of a PowerPoint presentation. The Specialist is the person who is a true expert in one particular field. The search marketing professional, the e-CRM expert or the mobile application developer. However, their deep subject matter expertise usually comes at the expense of broader experience in other forms of marketing. The Media Maven is an expert in ad units and media placements. They understand the most popular websites, how to spend money efficiently with Google, Facebook, Yahoo! or Ad Networks. The best ‘Media Mavens’ also know what creative units work best in each platform. The All Rounder is that rare individual who has done a lot of things in the digital world. They have probably built websites, engaged in social conversations, managed digital marketing campaigns, maybe done a bit of search marketing and are now passionate about all things mobile. A lot of people aspire to be ‘The All Rounder’ but very few walk the talk when it comes to do the various areas of digital marketing well. Don’t talk tech, talk business. This is a simple mistake I see so many marketers make. Talking about click-throughs, impressions or sentiment doesn’t mean anything to the CEO. If you can link your work to increased revenue, cost savings or higher levels of customer engagement/experience you’ll have the support of senior management. Try to be inherently social and mobile. The world is rapidly becoming about connected mobile devices. So focus all your efforts on truly understanding these platforms. Instead of building a website, focus on responsive design or building a mobile site first. For social, ensure every other form of digital marketing is inherently social. You can do this by adding social share buttons, opening up Apps or websites to comments, or integrating your work into social networks such as Facebook or Pinterest. More importantly, be social in your personal life – walk the talk! Blog, Tweet, Pin and interact with others online. Challenge what others tell you is possible in digital. Many forms of digital marketing are still evolving and there aren’t best practices built yet. There’s the potential for greatness in all forms of digital marketing. For example, no one even considered using YouTube for real-time (and wildly entertaining) conversations until Old Spice launched their legendary campaign for Old Spice Guy in 2010. If it was easy, everyone would be doing it. But because things are changing so rapidly in digital, there is potential everywhere. Reimagine and reinvent the best of your past work. You don’t need to reinvent the wheel every time you run a campaign or build a website. Go find out who’s already done a great job and build upon what they’ve done. Google have a wonderful process called Project re:brief where they review old campaigns and reimagine them for the 21st century (with a strong focus on social, mobile, search, YouTube video and digital activation). You can take the same idea with your previous work or the best work of others – relook at that last campaign, brainstorm how you could improve it and then make it happen. Deliberately open yourself up to criticism. Like the early point about being inherently social, it’s important to not just be good at digital marketing but take it to the next level by becoming a thought leader. I don’t suggest you do this to get famous, but to do this to put your ideas on the public stage for criticism, review and ultimately, improvement. You’re not great until you’ve been challenged and put to the test. If your ideas or work doesn’t stand up to criticism, you need to go back and continue learning. Read voraciously and continue learning. No one knows everything about digital marketing. and because of the pace of technology change, things are moving so quickly. It’s important to keep up-to-date with what’s happening in the world of marketing. At least 5 – 10 hours a week of solid reading andnetworking is required to keep at the top of your game. Even more importantly, you need to seek out best practice examples and learn from others. For example, meet up with digital marketing leaders and other Fortune 500 brands, have lunch with your agency once a week or fortnight, or attend regular marketing events and seminars. Challenge yourself to master another part of digital marketing. Your ultimate goal should be to become ‘The All Rounder’ – a master of all digital marketing arts. So if you’re great at search marketing, branch out and immerse yourself in social media or e-CRM. Keep challenging yourself until you’ve been successful at everything. Recently I wrote a blog post on how a digital marketing executive can get to a Marketing Director or CMO role. It raised a lot of debate about whether a specialist in any form of marketing can make it to the top, as well as bringing into spotlight the key responsibilities and skills a CMO needs to be successful. I strongly believe someone from any marketing specialisation (and in particular digital) can become a Marketing Director or CMO. In fact, many great CMOs have come from non-marketing backgrounds (such as Sales, Operations, and even Engineering). The secret lies in understanding the changing nature of what a CMO does, and the skills needed to be a successful modern Chief Marketing Officer. It’s NOT about doing great advertising. Although a lot of external media and agencies benchmark brands on this one aspect of marketing. Ads are great, but it’s only a small aspect of the overall responsibilities of a modern CMO. There’s a need to manage a very large media investment wisely. Many organisations have marketing budgets in the millions of dollars and some big brands have massive budgets in the billions of dollars. Managing a million or even billion dollars in media expenses is a massive responsibility that is often outside the skill set of most marketers. It requires a very strong understanding of finance, investment management and building the right capability with media agency partners. A modern CMO needs to have a deep understanding of technology and how it affects customer behaviour. Programs like CRM, digital marketing, social media, e-commerce and lead generation all need strong guidance from Marketing. There’s even speculation that CMO and CIO roles will merge into a Chief Digital Officer role in the near future. Regardless, modern CMOs need to be experts in technology to be successful. The modern marketing function is about change management and building capability. Running marketing campaigns is not the role of a CMO. Building the right competence in your field marketing team at regional and local country is. Capabilities include the right level of product innovation, marketing research and insights, strong lead generation and sales framework, agency and partner management, media investment management, digital and technology systems, and of course, hiring and retaining the best people. Marketing needs to have a very strong link to the Sales organisation. In some brands, sales and marketing are managed by the same leader but in many others they are separate functions. The best CMOs link marketing metrics to sales or business metrics otherwise they run the risk of irrelevance. Be an inspirational leader. Inspire and support your team and in turn attract the best talent into your organisation. Have a deep understanding of the customer and be the “Chief Customer Officer” for your organisation. This is more than doing market research but truly putting the customer first and getting a deep understanding of how customers view your brand and products – every day. There are many other traits and skills needed to be a great modern CMO, but if you are good at several of the key points above, you have a great chance to be a top CMO of the future. Good luck on your journey! This blog post originally appeared on the Firebrand Talent blog. Community Management – This is increasingly about managing a pre-built editorial calendar, managing digital assets (images, videos, written posts, etc.) and moderating community comments. Customer Service – As much as 40% of enquiries via social media platforms (specifically Facebook and Twitter) are customer-service related. Technical – especially if you’re running digital display with media that is managed via real-time bidding, you are doing e-CRM with re-targeting and multi-variant testing, etc.). Niche and often overly specialised. For example, Search Marketing professionals are now often responsible for both paid search/PPC and SEO, and to be great, require a number of years specialising in the craft. A successful digital marketing function = change management. Digital marketing in large organisations is about building capability and making change. This includes tools, processes, ongoing education and executive level training. Your job should be to help make all marketers digital, not just a select few. Shift from operations to achieving results. I don’t mean hitting campaign targets or driving incremental sales. When I talk about results, I really mean achieving the “wow” factor. You see this in memorable digital work like Old Spice Guy’s ongoing social engagement, or more recently inSamsung’s “The Next Big Thing” work. These campaigns think big and achieve big. Do this, and you’ll be on the fast-track to success. Develop great presentation and communications skills. It doesn’t matter where you are in an organisation, if you can’t communicate or present well, you won’t get to the top. Stop talking about tactical digital metrics and start talking business objectives. Too many marketers get caught up in impressions, click-throughs and social media sentiment. CEOs don’t care about these things. They care about sales, market share, savings/efficiency and building great relationships with customers. Tactical metrics are important but they need to be clearly linked to business metrics. Be a thought leader. If you have deep subject matter expertise, share your knowledge. Consider presenting externally, talking to the media and blogging/writing. Even better, if you can help senior management understand how digital and social is impacting your customers, this is a big win. Lose that sense of entitlement. This is much more subjective but I often see those starting out in digital with inflated job titles (or even worse they are “ninjas” or “jedis”!) or overconfident because they know more about a particular niche skill than others. Be humble and patient. As you grow older and wiser you’ll realise that your previous big title or knowing how to grow a Facebook Fan or Twitter Follower base doesn’t entitle you to a Marketing Director job. Understand the broader marketing landscape. You might not want to hear it but TV advertising still dominates marketing. Never be a “digital vs. traditional” person. Be smart and learn how digital and social media works well with other forms of marketing in the media mix. Understand that your social networking ability does not equal actual networking ability. So much of working in a big brand is about building strong relationships and networking. Sadly, being great at social networking often limits your skills at face-to-face networking. Get out from behind the PC or off your mobile phone and learn the art of conversation. Understand both brand marketing and performance marketing. Unfortunately digital marketers tend to fall into one of two camps – driving brand engagement (through social marketing, online video, digital display, etc.) or focusing on sales (through search, e-CRM, affiliate marketing, etc.). CMOs need to understand both to be successful. Realise that eventually some other new technology will come along and it’ll shake things up. It’s been happening since the invention of the ink and quill. New technology enters the market and changes how people interact with each other. It’s inevitable and some radical shift will happen again soon. Please don’t look down upon your senior managers who have struggled with the introduction of the PC, Internet, tablet, social networking and smartphone (to name just a few). You’ll be in that same place soon, I guarantee it.